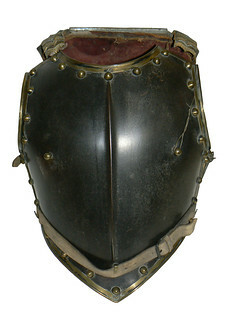 A cavalry cuirass, consisting of a steel chest and back plate, believed to have been produced in France or the German States in the mid-19th Century. Plate armour of this style was worn by cavalry units throughout the 18th and 19th century. They are strongly associated with the British and Germanic Hussars and the French Curaissiers. This particular cuirass is believed to have been produced in France or the Germanic States in the mid 19th Century, and was potentially been worn in the Crimean or Franco-Prussian War. The cuirass is made up of two sections of darkened steel plate armour. The front piece has a central vertical ridge and is angled to a point at its base. Both pieces of armour are edged with gilt metal and punctuated by gold coloured raised rivets. Hinged overlapping shoulder straps extend from the top of the rear plate. These are gold coloured and decorated with a floral design. Leather straps would originally have been attached to these shoulder straps, and would have attached to two raised rivets on the centre of the chest plate. The armour is lined with a red coloured fabric. A white coloured leather belt is riveted to the rear plate and buckled around the base of the front plate.